“Where you going to run? This is Margate!” yells the stocky Mr. Big of the over-familiar seaside crime thriller Hard Tide. This small town on the Kent coast seems an unlikely setting for nefarious doings but the film starts out as a convincing enough tale. Jake (Nathanael Wiseman) is a drug dealer and enforcer, a chippy skinhead who strides about the waterfront and housing estates with his bag of wares and the occasional duffing up to be delivered. He has a past of foster homes and a criminal kingpin father (Ralph Brown) who is about to go into prison and leave his estranged son in charge of the family business. Unsure as to whether he wants this, Jake is trying to make it on his own with the help of his unreliable friend Alfie (Oliver Stark) with whom he is finalising a drug deal that might just see their boat come in, both literally and figuratively. A burgeoning romance with Kim (Katerina Gellin) from the nail salon also offers Jake some relief. However, rival dealer and all round psychopathic gangster Mr. Flowers (Mem Ferda) lurks as a danger in the background even as Alfie wants to partner up with him. 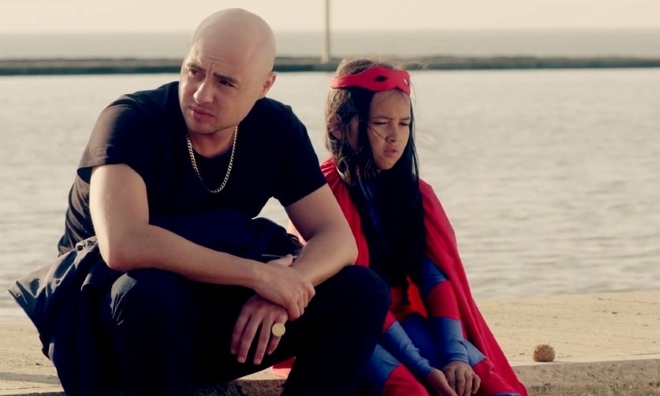 Through chance, Jake also falls in with a nine-year-old girl, Jade (Alexandra Newick) who, wearing her Supergirl costume, lives perilously between her own imagination and neglect. When a fatal accident throws Jake and Jade together, Jakes plans are all thrown into confusion and the dangers surrounding him become more acute. In his poem The Wasteland, T.S. Eliot wrote “On Margate Sands./ I can connect/ Nothing with nothing./”. So it goes with Hard Tide. Although based on a true story, the film is ultimately capsized by its own influences and ambitions. The aerial shots of Margate don’t exactly inspire the sense of an inescapable concrete jungle and detract from what could have been a smaller more intimate story. The florist shop which nominative determinism’s Mr. Flowers runs comes straight out of Ben Affleck’s The Town; the unlikely friendship between Jake and Jade feels like Luc Besson’s Leon and the unreliable best friend can be seen in many films, from Mean Streets to The Pope of Greenwich Village. These broader generic strokes overwhelm the original premise. There’s also a subplot with a harassed social worker (Beverly Hills) trying to chase down Jade’s father and follow up on her case, but this moment of social realism doesn’t sit well with the more conventional British gangster tropes. On the plus side, the film is well shot by Joe Mannion and Wiseman – who co-wrote and directed with Robert Osman – is excellent as Jake, at once convincingly tough and streetwise with glimpses of a likeable vulnerability.